Fresh from its awards success at the first Animation Is Film festival and screenings in London Film festival this month, a new trailer has arrived for Cartoon Saloon's The Breadwinner. Nora Twomey's adaptation of the acclaimed bestseller from Deborah Ellis tells the story of a young girl named Parvanna in Taliban controlled Afghanistan. Twomey's solo directorial debut (she also co-directed The Secret Of Kells with Tomm Moore) is already attracting awards buzz. This second trailer gives us our best view of the film so far- and the word that comes to mind here is "intense". It's clear that this is a very different film from anything we've seen from Cartoon Saloon so far. This is reflected in the fact that the film has been awarded a PG-13 rating from the MPAA (for "thematic material" and "some violent images"). If you were expecting another Kells or Song Of The Sea, prepare to be surprised. The animation looks recognisable as a Cartoon Saloon movie, but we also get a taste of what appears to be several fantasy sequences made in a different animation style. Altogether it looks sure to be the studio's most ambitious feature yet. 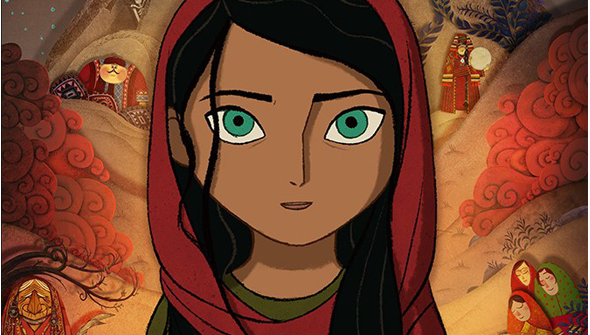 GKIDS Films will release The Breadwinner in US Cinemas on November 17, while StudioCanal will bring the film to the UK and Ireland in May 2018. See the previous trailer here. Check out the latest episode of our podcast to hear Rachael and Dan give their first thoughts on the film.